Dada Robotnik: Giovanni Progress: First weekend down. Giovanni Progress: First weekend down. It's been an insane set of days. We orchestrated rooms full of people and assembled crane shots in a tiny, meticulous house. We filmed bikes racing across town and shut off traffic for an hour using some traffic cones and a flashlight with a piece of orange gel taped on it. We lurked in Liberty park with a hipster, an anarchist punk, and a drag queen, yelling swear words at the top of our lungs. I worked myself to exhaustion, Al stopped talking, and Chris is probably gonna fail all his classes. Not to mention the 5-10 core people who showed up tirelessly to every shoot they could and stayed up all night doing menial jobs because they believed in the awesomeness of the project. I'm humbled by that kind of selfless devotion to the work I'm trying to do, and I hope someday to do you all justice. The results have been so great. I'll edit all week and have a better idea of what we have, but I am so impressed, and I began with unrealistically high expectations. Thank you all. So much. Giovanni flees the scene of the crime. Leo stands up to Giovanni. Giovanni has anger management problems. Stay tuned. 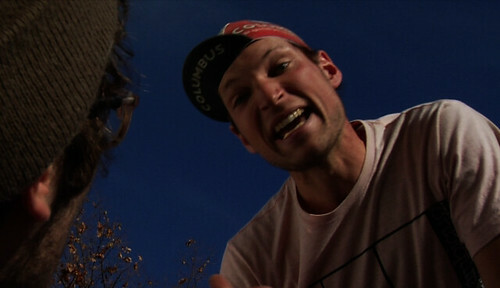 Filming a braveheart-worthy Alleycat on Sunday the 15th at 1:00 PM, be there on time, and join the madness. I'm pretty excited to see the end result off all this. You mean 1pm for the alleycat right? Oh. heh. ya :) fixed. Elvira is lookin' good! 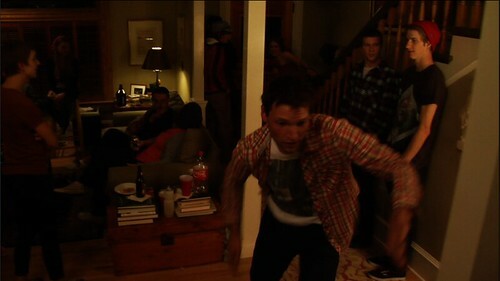 I like the picture of Chris escaping and how everyone is still kickin' it in the background like nothing is going on. have a fantabulous time at the alleycat! i'm so excited to see the film coming along. Women's SS cyclocross, I love you. First Cyclocross race attempt full of awesome. Break from movie for.... BMX!